Please contact Sales and Service for your specific need. Visit the Service / Repair page and Used Inventory and Sales page for additional information. This company will serve your every need . . . with dedication and family values! Our goal remains constant: provide quality customer-focused service, fast repair response and evaluation, FREE pickup and delivery, 24/7 support, a highly skilled technical staff, and a level of proactive preventive maintenance programs that customers depend on! 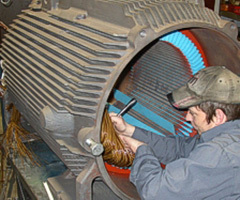 We have three convenient locations fully equipped to repair AC and DC electric motors from fractional to large capacity HP. We repair pumps large and small and specialty motors such as the newer wind and solar generators / motors. We satisfy repair needs across the Midwest.